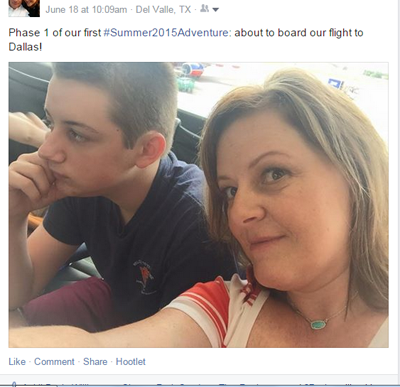 Earlier this summer, I spent an afternoon laying out our summer plans in the calendar and plugging in dates for a trip to visit my parents in Fort Worth. We live just north of Austin, which is about a three hour drive straight down I-35 from the Dallas-Fort Worth Metroplex. Since we make this very boring trek several times throughout the year, I got a wild hair to make this one an adventure. I had a ton of miles to burn with Southwest Airlines, so I booked a flight for me and my two boys, which meant we only had to pay tax on our flights. Score! It only cost us about $16, total, for the flight. Southwest Airlines doesn’t fly into D/FW Airport - only into Dallas Love Field, which is more than an hour away from my parents’ house. No problem! 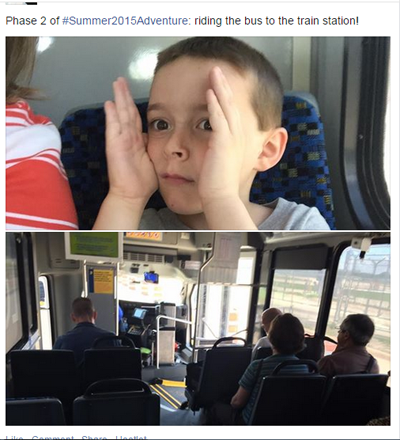 We’ll take the train over! It’ll be a blast! We missed the bus. Ack! Fortunately, I had spent the last few days researching our route, figuring out which tickets to get, and carefully planning the transfers we needed to make. I downloaded the GoPass App. I had this down. We caught the next bus, which would take us to the first of several trains we’d eventually ride throughout the day. I climbed the steps, opened up the app, and showed the driver my phone. She was very kind, but I could tell she was annoyed by the fact that I was showing her the home screen of the app, which told her exactly nothing about whether I’d purchased tickets. As the line built behind me, she patiently showed me how to use the app. The Teenager was manhandling our gigantic suitcase behind me while the other travelers in a hurry to get to their destinations were getting antsy. I didn’t care. I was having an adventure with my boys! We made our connection to the first few of our train transfers, easy-peasy. Our next stop would put us in West End neighborhood of Dallas, and our last connection wasn’t for more than an hour. Plenty of time to grab lunch in one of those cute little neighborhood-style cafes, but it would mean we’d have a few blocks’ walk. It was early afternoon at this point, and pretty toasty: a balmy 93 degrees. My boys (and I) are air conditioning people. We need our forced-cold air. When I get hot, I get panicky. Since we hadn’t eaten since early morning at the Austin airport, we were getting shaky, and needed some lunch and a big, cold drink. The Teenager voted to stay at the train stop and wait the hour for the next train. Little Man wanted food, but he wanted me to go get it for him. Since I wasn’t interested in seeing myself on late night news, begging for my children to be returned to me (mainly because I looked absolutely terrible, since my makeup had long since slid off my face), I decided we’d all go together. The walk through the crowded streets with a ginormous suitcase and a whining 7-year-old was a real treat. The Teen had had an attitude adjustment by this point, and was helping me talk the little one down off the ledge. We decided on pizza from an adorable little cafe, but the line was out the door. I had the boys wait off to the side - with the giant suitcase - in this over-crowded, teeny-tiny cafe, and I went through the line to order. They made food to order, which meant we were looking at a good 15- to 20-minute wait for our food. Our next station was a few blocks away, and we weren’t 100% sure exactly how to get to it, so I didn’t want to risk it. Since I’d waited in the long line, the manager said he had some extra garlic knots he could sell me. Yes! 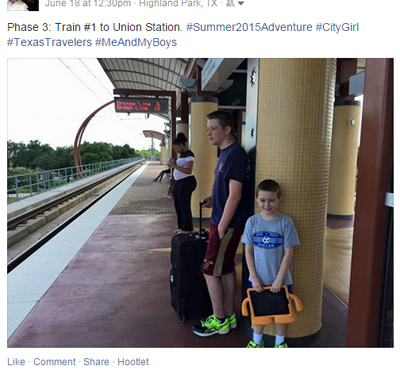 It was time for us to start walking toward the next train station for our last leg of The Texas Tour. As I pulled up the directions on my phone, The Teen pointed us in the direction we should go, based on a sign he’d seen. So we headed that direction and by the time the directions pulled up, and I felt like I had my bearings, I realized we were walking the wrong direction - and had been for at least a full block. 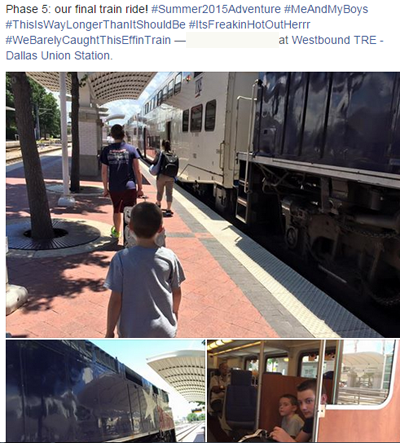 We had just a few short minutes to catch the train, and if we missed it, the next one to Fort Worth wouldn’t come for another three hours. We had to catch this one. Our lives depended on it (the lives of my boys did, lets be honest). 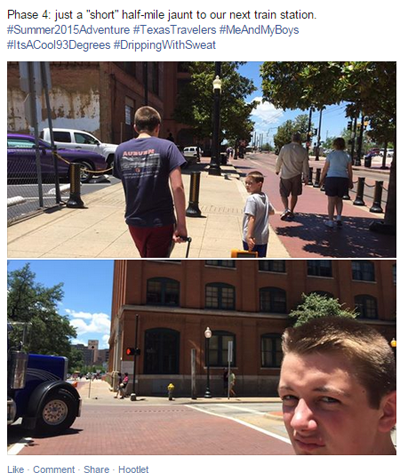 Just a few blocks away from the station, as we waited for the light to change and let us cross the street at Elm and Houston streets, I looked at the boys with their flushed faces and sweaty hair, the old Texas School Book Depository as their backdrop. My irritation went away for a quick minute when I realized the memories we’d made that day. The light changed and we rushed across the street and hauled balls toward the train, ringing its last-call horn. We made it just as the doors closed, thank Jesus. 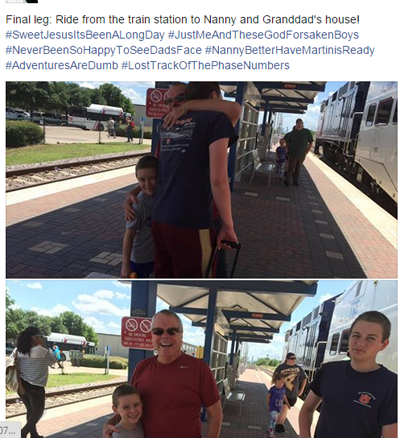 It was mid-afternoon, now, and in just about a half-hour, my dad would meet us at the station in Fort Worth. Had we driven, we’d have been at my parents about four hours earlier. We’d have been in blessed air conditioning the entire time, there wouldn’t have been any carting of suitcases, or arguing about tired feet. We would have gassed up that morning, packed up the car, and had an easy drive up I-35, just three hours, door-to-door. And we wouldn’t have remembered that day at all.